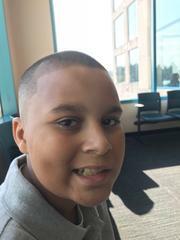 David Ledden, 13 years old, Black male, 5'-0"/130 lbs., black hair and brown eyes, last seen wearing a tan camouflage t-shirt, aqua blue basketball shorts with black stripes, black Sketcher tennis shoes. Last seen: 100 block of North Wilson Ave. The missing has the mental capacity of a 7 year old. If you have information that can assist in helping safely locate David Ledden, please call 911 or contact the police at 626-744-4241.